The Contemporary Cocktail Bar: What Is Mixology? The Contemporary Cocktail Scene: What Is Mixology? 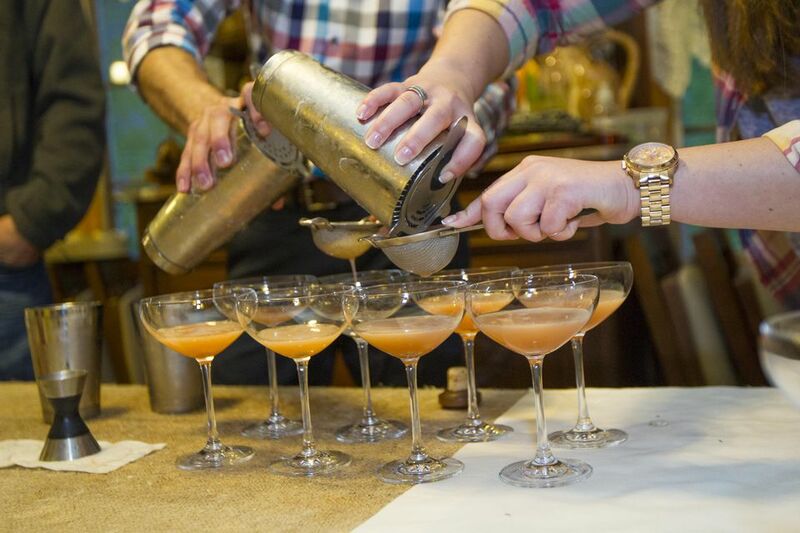 Are you a mixologist or bartender? The terms "mixology" and "mixologist" have become a regular part of bar vocabulary. They are being used more and more to describe a style of mixing cocktails and the people who practice it. However, exactly what is mixology? Well, that's a good question. Mixology is another term for mixing drinks or bartending and a mixologist is another term for a bartender or bar chef. Mixology is generally accepted as a refined and in-depth study of the art and craft of mixing drinks. Think of it as the study of the chemistry of drinks, and the mixologist as the professional who studies that. Merriam-Webster's dictionary dates mixology to 1948 and defines it as, "the art or skill of preparing mixed drinks". Mixology's definition and its use are the topics of much debate in the bartending community, usually because of the impression it leaves: that a mixologist is better and more skilled than a bartender. This isn't necessarily so. Neither one is "better" than the other; each requires both the same and a different set of skills. The two titles can be interchanged. Is a mixologist just a fancy, scientific-sounding name for a bartender? Technically, yes, but there is a generally accepted difference between the two job titles and the two can be used interchangeably. Still confused? Studies and help evolve the field of bartending. Creates innovative cocktails, often using unique, housemade or historical (and now uncommon) ingredients and combining those to create unusual tastes in drinks. Studies and reimagines classic cocktails. Mixologists are also known for making a name for themselves in cocktail literature and industry-wide consulting jobs. Some work behind a bar regularly and others do not. In contrast, the title "bartender" conjures up images of men and women who can whip out 20 mixed drinks and 50 draws of beer before anyone knows what happened. They are a talented, multi-tasking group that can do all that while keeping a crowded bar happy, lively and tipping. A bartender needs to have a variety of skills which are very important and some that the mixologist may not develop or use on a regular basis. Of course, both of these definitions are just stereotypes. There are many fine mixing professionals who fall into both categories and many more who specialize in one or the other. Each has its own merits and the debate continues in the professional bartending community. In fact, many pros behind the stick are against the use of "mixology" altogether and many of those are ones that others would consider mixologists.